The Children’s Theatre Company and Penumbra Theatre co-production of The Wiz is an engaging endeavor that makes you wish these two theatre companies had teamed up earlier. Director Lou Bellamy and choreographer Patdro Harris have created a production boasting energetic dancing, colorful sets/costumes, and extraordinary singing by some of the finest local stage singers. If you’re not familiar with The Wiz, it is the second of three very different and now-iconic stage musicals to come out of the same source material (The Wizard of Oz and Wicked are the first and third, respectively). William F. Brown adapted this show from L. Frank Baum’s classic novel The Wonderful Wizard of Oz. Charlie Smalls wrote both the music and lyrics that can be defined as Motown pop. Tina Tippit provided additional material for the show. This musical premiered on Broadway in 1975 and won seven Tony Awards including Best Musical, and thereafter launched into the musical theatre canon. This collaboration between two long-standing Twin Cities’ theatres assembles a lot of talent under one roof. Paris Bennett (of American Idol fame) stars as Dorothy, a teenage girl from rural Kansas. She is whisked away in her family’s farmhouse to the land of Oz via a tornado. This time, however, Oz is akin to New York City: Munchkinland is modeled on Coney Island, the forest on Central Park, and Emerald City on Harlem’s Apollo Theater. Dorothy meets Addaperle, the Good Witch of the North (Amiee Bryant), who sends her down the yellow brick road on a journey to the Emerald City. Along the way, she meets the Scarecrow (Dwight Leslie), Tinman (Dennis W. Spear), and Cowardly Lion (Rudolph Searles III) who join forces with her. As their adventure progresses, the foursome come into contact with the Wiz (T. Mychael Rambo), the Wicked Witch of the West (Greta Oglesby), and Glinda the Good Witch of the South (Jamecia Bennett). The Scarecrow (Dwight Leslie),Cowardly Lion (Rudolph Searles III), and Tinman (Dennis W. Spear) join forces with Dorothy (Paris Bennett). Photo by Dan Norman. The plot of The Wiz is similar to the movie classic, with minor nuances, but this interpretation of the story centers on vivacious dancing, powerful ballads, and soul music with uplifting messages about believing in one’s self. Paris Bennett, who is nearly thirty, convincingly plays a teenage Dorothy with her youthful exuberant persona. When she sings her solos with the powerful voice of a fully mature woman, there is a bit of a disconnect. (CTC’s 2015 production of The Wizard of Oz had the opposite arrangement.) Seales’ Lion plays Dorothy’s protector and closest confident with incredible leaps and dance moves. Spears’ has a great time with his Dixieland solo “Slide Some Oil to Me.” Leslie also does a nice turn as the wise-cracking Scarecrow. Bryant plays a bubbly and, at times, ditsy Addaperile. Rambo is a less fearsome Wiz and deftly eases into the show-stopping song-and-dance sequences “Believe in Yourself” and “Y’all Got It!” Jamecia Bennett (in an interesting piece of trivia, the real-life mother of Paris) sings a powerful and stunning version of “A Rested Body is a Rested Mind”. The most impressive song performance, however, was Oglesby’s rendition of the R&B song “Don’t Nobody Bring Me No Bad News.” The only disappointing aspect of Oglesby’s performance as the Wicked Witch of the West is that she has so little time on stage before her liquidation. Vicki Smith’s vivid set designs are smartly matched with Mathew LeFebvre’s costume designs, with mood lighting by Don Darnutzer. Greta Oglesby (center) with the ensemble. Photo by Dan Norman. Vicki Smith’s colorful set designs are especially compelling for the targeted children’s audience. 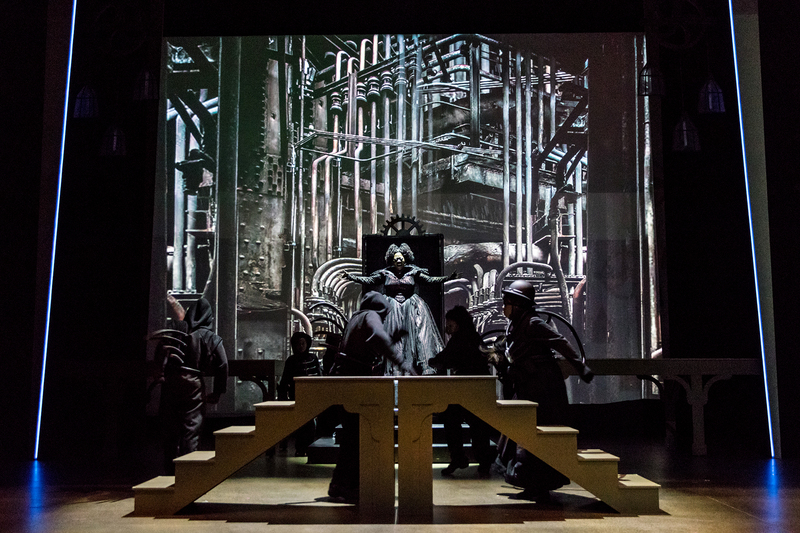 These sets are matched in intensity by Mathew LeFebvre’s bright costume designs. Don Darnutzer’s lighting design enhances both the sets and costumes with gleams and sparkles. One of the best visual moments is when all three elements come together to transform the darkness of the wicked witch’s castle into the colorful and uplifting scenic dance number “Everybody Rejoice/A Brand New Day”. Sten Severson’s sound design was spot-on for a show that is heavily dependent upon sound effects, most notably the whooshing sounds of the flying monkeys. Music director Sanford Moore leads a strong brassy orchestra, however the music overpowered the singers during a few songs making it difficult to hear the words. The first act gets sluggish in places and the younger audience members appeared to lose interest and, at times, started talking. But the second act starts out strong with the arrival of the wicked witch Evillene and continues to hold the interest of both the young and older audience members with the dazzling performances of the Wiz and the good witch Glinda. The array of talent in this production of The Wiz provides for a fantastic experience. 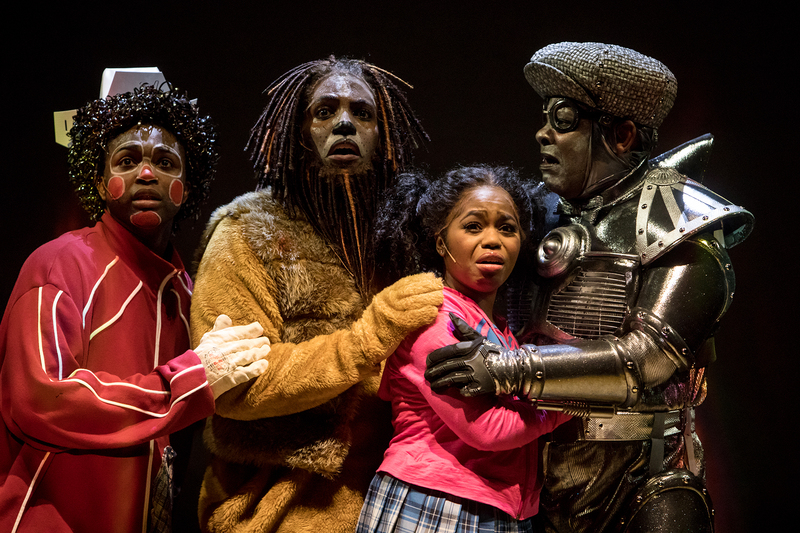 The Wiz plays at the Children’s Theatre Company in Minneapolis, MN through March 18.